What a great mail day today! Review Time! I received 2 orders today in the mail--actually 3 if you count 2 pretty glass beaded pendants. I received my Aunt Nancy's Handmade Soaps (from 4/18) and Spa Therapy Works (also from 4/18) orders today. I also received my very small March 13th Isle of Eden perfume order yesterday afternoon. I'll start with my order from yesterday. First of all, I was immediately more impressed with this Isle of Eden order. My last one was for a whipped bath cream, thrown in a box without any padding, bubble wrap, tissue, etc...just a bath whip and a box. The product smelled nice upon cold sniff, but the Chocolate Cappuccino Cake smelled like stale coffee on my skin and the base wasn't blended (as if the oil, perhaps, had been omitted while mixing the base). I knew this was partially my fault for ordering a fragrance that can be "iffy" with my body chemistry. I received my small box and my 2 roll ons were wrapped carefully in plastic, then in colorful tissue and shredded decorative paper. No leakage! I like the EDPs upon first sniff. Both will benefit from curing, or waiting a week or two for the fragrances to blend with the base and reach their full scent potential. Waffle Cone Explosion is really nice, albeit light. It smells just like a waffle/sugar cone without other notes. I know that the scents will cure well; I can tell already! I have put it away until next week. I really am enjoying The Verge of Love. It is a very multi-faceted and true bakery delight. I immediately smell the dark chocolate and after wearing it for about 30 minutes the other scents are becoming apparent. This one will be a repurchase, I am sure, once it is fully cleared. Very nice chocolate scent! I love chocolate scents, and many smell fake (almost like a Milk Duds candy). It is for that reason that I made my own chocolate blend called Scrumptious. My blend is a non-pastry chocolate. It has deep, rich bittersweet chocolate, orange peel, nutmeg, vanilla absolute and almond--very grown up. I love bakery-inspired scents and this one from IOE sounded wonderfully decadent with its mocha notes as well. This one is a winner! Today I opened another wonderful package from Nan at Aunt Nancy's Handmade Soaps on Etsy. 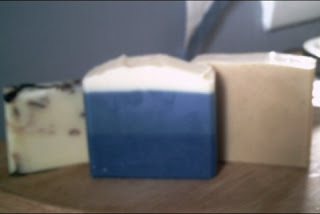 I received 3 large bars of soap: Chocolate Peppermint, Black Raspberry Vanilla Layers Olive Oil Soap (as labeled; on her shop page it is "Black Raspberry Vanilla Skies"), and Chamomile Infusion. Nan also included a star-shaped sample of Lavender & Basil soap. Nancy is a wonderful, skilled soaper. She obviously loves what she does and it shows in her products. The Black Raspberry Vanilla Layers is almost too pretty to use! It is two shades of blue and cream. Nan doesn't use artificial colorants; she used ultramarine blue in this one. The Chocolate Peppermint is a repeat buy because it is my most favorite bar soap ever! The Chamomile Infusion smells like something you'd find at a luxurious spa retreat. She uses chamomile tea in this and it smells light and comforting, yet there's that herbal "zing". Wonderful scent! This is one I plan to use on my boys. I cannot speak highly enough about Nan's soaps. She uses wonderful ingredients, including high amounts of olive oil. She incorporates clay into the blends of many as well. My Chocolate Peppermint bar contains high-quality cocoa. She places a great attention to detail on every soap she makes for her customers. More importantly to me is the fact that she will not use palm oil in her soaps. Those who use palm oil, palm kernel oil, palm derivatives, palm wax in their candles, etc... are all contributing (many unknowingly) to the death of orangutans because their habitats are being destroyed and they are dying off or being killed by the workers clearing way for getting the palm. On a brighter note, I received another fantastic natural deodorant from Spa Therapy Works over on Etsy. I already adore the Brown Sugar Almond. I decided to order Pink Cupcakes. It truly smells just like a pink cupcake! I know from my other one how effective this wonderful product is, so I know I'll be ordering from them again! A great fundraiser going on right now! Are you a Person 1 or a Person 2?